It's not hyperbole to suggest that Anthony Joshua has already established himself as the most exciting heavyweight of this generation. At 20-0 and with all of his victories coming by way of knockout, Joshua has captured the imagination of the boxing public. Already he's a megastar in his native Britain. His fights sell out stadiums and every outing of his is a pay per view in his home market. He's a natural with the microphone as well, projecting confidence, determination and humility in perfect proportions. Joshua's emergence has led to the symbolic end of the prior heavyweight era, one characterized by robotic and often overly cautious Eastern European champions, typified by the Klitschko brothers. He has reminded boxing audiences that heavyweights can be fluid athletes and needn't shy away from hostilities in the ring. On paper Joshua has it all: two heavyweight belts, an adoring fanbase, a savvy promoter, network support, a first-rate trainer, matinee looks and natural affability. However, Joshua has already come to a crucial precipice in his career. Sure, right now he could consider himself the best heavyweight in the world and the claim would be legitimate. But will he become the rightful heir to the greats in the sport's glamour division, or will he remain just the best current heavyweight of a rather mediocre division? Will Joshua take the steps in his career needed to become one of the immortals? Last Saturday Joshua knocked out Carlos Takam, a late replacement opponent, in the 10th round. Joshua won a virtual shutout on the cards prior to the stoppage although it should be said that Takam had his best moments of the match in the latter rounds. Despite the win, Joshua's performance wasn't among his best as a professional. At a career-high 254 lbs., Joshua moved more ponderously in the ring than he had in his more recent outings. He fired mostly single shots instead of combinations and he loaded up early in the fight on seemingly every punch, trying to knock out Takam in short order. Still, Joshua won the early rounds fairly easily. In the 4th, he connected with a sweet counter left hook that forced Takam's glove to touch the canvas – a clear knockdown. However, as the rounds progressed Takam got more adventurous. 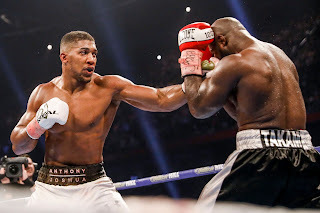 Finding safe haven on the inside, Takam did a fair amount of grappling, which reduced Joshua's clean connects. He fired off a number of left hooks to the body without receiving anything significant in return from Joshua. He also landed a number of clean lead and counter right hands. Even though Takam had moments where he did good work, Joshua was still taking every round. And on a night where Joshua was far from his best, he managed to defeat a capable opponent without needing to go into a higher gear. Off nights routinely happen in boxing and it would be unfair to penalize Joshua for not necessarily firing on all cylinders against Takam. Joshua remains truly formidable in the division and it will take an excellent fighter to beat him. 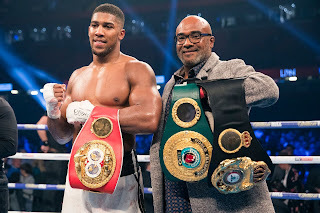 At 28, Joshua is in his athletic prime and although he's had a wildly successful start to his career, remember that he's had only 20 professional fights; there are still areas where he can improve. Perhaps most importantly, he and his team, which includes head trainer Rob McCracken, need to find an ideal ring weight. 254 was too big for him. He didn't use the ring like he could have and he didn't move with the same agility that he has in previous fights. Joshua's physicality and size will always be advantages for him but he shouldn't be curtailing his mobility and flexibility. Strategically, Joshua needs to understand what makes him such a singular presence in the heavyweight division – his combination punching. Joshua isn't the best puncher in the division. He's not the fastest guy. But he has a large punch arsenal and the coordination and technique to put several power punches together in rapid succession. When Joshua can land his right cross, left hook, jab and uppercut, opponents can't defend against his variety. Conversely, when Joshua was just trying to drop Takam with right hands early in the fight on Saturday, Takam survived quite easily. Knockouts are special. They electrify audiences. It's not that Joshua should forego KO's in favor of clever boxing, but he needs to remember that his knockouts come from multiple hard punches. He's not Deontay Wilder, who can end the night of any heavyweight with just his right hand. Joshua needs to set up his shots. Keeping his body loose and limber will help put him in position to land his best power punches. Joshua shouldn't be aiming to win pinup contests; he's there to dispatch opponents. Technically, Joshua still needs to work on his jab. In the Takam fight, Joshua returned his left to his waist after throwing the jab, leaving his left side completely open for a counter shot. This tendency could become quite problematic for him. Hopefully McCracken can help iron out that bad habit. If this sounds like I'm nitpicking Joshua's performance, perhaps there's some truth there. But these aspects are what Joshua must improve upon if he wants to get to the next level. Perfecting these areas will allow him to have a run of dominance at the top level of the sport. Joshua stands on the threshold of greatness but there's no guarantee that he reaches that lofty perch. Many fighters have succumbed to the trappings of success, the infatuation with their headlines, overconfidence or complacency. For Joshua, his biggest enemy in achieving boxing immortality may be himself. He'll be favored against fellow titleholders Joseph Parker and Wilder and perhaps only by allowing himself to be at a level beneath his best, will opponents defeat him; however, these scenarios happen all the time in boxing. Keep your left hand down against Carlos Takam and you'll be fine. Do that against Wilder and it could be career-altering. Earlier in the year, Joshua engaged in a Fight of the Year contender against Wladimir Klitschko where both fighters hit the canvas. Joshua demonstrated confidence, resolve and poise to climb his way back into that fight after being so badly hurt. But let's remember, that bout also showed that Joshua's defense can be penetrated. No matter how euphoric the praise may be for Joshua in some quarters, he has proven to be vulnerable. That's not a fighter who should be overconfident and making some textbook defensive mistakes. It's up to Joshua's to decide how good he wants to become. If he's self-satisfied, then his current level is certainly sufficient to compete against the best in the division. However, if he wants a truly memorable reign atop the heavyweights, and by implication, the sport of boxing, now is where he needs to tighten up these potential holes. With improvement in his Ring IQ – understanding what type of fighter he truly is – he will become even more formidable. Getting himself in optimal boxing shape, not body sculpting, will enable him to go 12 hard rounds and fire off his best weapons: combinations. And finally, he needs to remember that he can be hurt. Joshua didn't defend his body well on Saturday and left himself too open for counters. There smacked faint whiffs of overconfidence in the ring. Joshua possesses the physical and technical attributes to become a great heavyweight but very little is given in this sport. Joshua must seize the moment. Like many fans, I'm captivated by his potential. Will he slip up? Will the next ten years be the Joshua Decade? More than anything else, it seems as if Joshua himself holds these answers. Will he play his cards for greater reward, or will he cash in his winnings, content to call it an evening? He's a member of the Transnational Boxing Rankings Board. This is a perfect and eloquent boxing specialist Hope this article will reach Anthony Joshua.